Lady Lupin Lorrimer Hastings is the pretty, but scatterbrained, young daughter of an earl. Aged 21, and rather to her surprise, she marries an Anglican clergyman, 43-year-old Andrew Hastings, vicar of St Mark's Church in Glanville, a fictional small seaside town, modelled on Eastbourne where the author had lived. She makes a highly unusual clergy wife, frequently saying the wrong things but liked because she means well.She soon finds that everyone seems ready (too ready, she thinks) to confide in her. But she "was a kindhearted girl and liked everyone round her to be happy and comfortable". She is "not a profound thinker" and often sounds naïve, as when she explains : "I am afraid we must go; you see tomorrow is Sunday and Andrew always gets up early on Sunday to go to church, you know." And she gets things confused: "Weren't there some people called Jews or Jesuits or something who thought it was all right to do a thing wrong if it was going to turn out right in the end?" Or, about a new curate: "It is so nice if you get a curate who is interested in religion and that sort of thing, isn't it?" But she can also be very much on the ball. When she called out the name Stephen in her sleep, her husband complained: "I wish you wouldn't call out other men's names in your sleep, darling. The best vicar's wives don't do that sort of thing." Lupin looked thoughtful for a moment. "How do you know?" she inquired. She does not do a great deal of detecting, but is a lot of fun and has insights that set the police in the right direction. 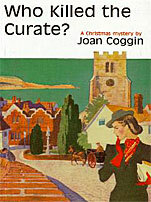 She was the first of the vicar's wife detectives. Joan Coggin (1898 - 1980) grew up in the seaside town of Eastbourne in England, where her family moved after the death of her mother when she was eight. She was educated at Wycombe Abbey school, which she left in 1916 to take up war work and eventually became a nurse at Eastbourne Hospital. After the war she resumed the social activities expected of a young woman of her class, but also worked for the Guides and the blind. 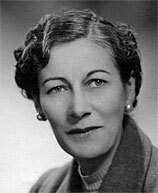 In 1935 she published her first novel for girls, Betty of Turner House, using the pseudonym of Joanna Lloyd (her mother's name) This was followed by five more girls' school books and four detective stories featuring Lady Lupin, all of which were published between 1944 and 1949. Then she wrote no more for 30 years before she died at the age of 82. Her long out-of-print (and now very rare) detective books were, rather surprisingly, reissued by The Rue Morge Press in Boulder, Colorado, between 2001 and 2003.
Who Killed the Curate? is set at Christmas 1937, and sees the newly-wed, but young, lovely and scatterbrained Lady Lupin getting used to being a vicar's wife at St Mark's Parish in Glanville, Sussex. She does not know what to say when she is confronted by a Sunday School class: "Miss Gibson said would I like to ask them a question; I felt absolutely paralyzed, and all I could think of to say was, 'What is your favorite pudding?' As a matter of fact it went most awfully well and the children looked more intelligent than you would have thought possible and they all began to answer quite brightly; but I don't think it was an enormous success with Miss Gibson and the teachers." She finds herself hopelessly at sea at meetings of the Mother's Union (where she feels she should not really be admitted because "she has only been married six weeks"), and at the Girl Guides, an organisation of which the author had been a member for many years and knew just how to poke fun at the Guiders and their pretensions. One of them was a Miss Phyllis Gardner who lived with her aged parents and had never given them a moment's trouble. "Her chief interest was Girl Guiding, in fact it was more than an interest, it was almost a religion and she held jealously to all its rules and regulations, disliking every change to the movement that the years brought along ... she longed for the time when every girl in the town should be in uniform .... saluting Union Jacks, singing "Land of Hope and Glory" and signaling Morse and tying knots in their spare time." There is a hilarious Guiders' meeting when all the rivalries come to the fore. But when they start talking about Second Class Tests, Lupin could not help remembering "an elderly woman she had once met who had nursed in Italy in the War, and had been awarded the Order of Chastity, Second Class. She began to giggle." Then her husband's curate gets poisoned and she enlists the help of her old society pals, Duds and Tommy Lethbridge, and Andrew's nephew, an unlikely British secret service agent, to form "a band of detectives" and so get at the truth. Loops (as her society friends call her) refuses to believe that Diana Lloyd, a 38-year-old author of children's and detective stories (just like the book's author!) could have done the deed. But all the other suspects seem so nice that Lupin announces that she will help the killer escape if only he or she confesses. Lupin is certainly an entertaining character, and there are really amusing incidents, but you can't take the plot at all serously and the long conversations get rather tedious. As to who "did it", you couldn't care less. The Mystery at Orchard House takes up the story over two years later, but is still set in in the 1930s, this time shortly before the Second World War. Lupin now has a two-year-old son, Peter, but a recent bout of influenza has forced her to leave him in the care of her husband and her old nanny, while she takes a supposed rest cure in the country at Orchard House, a hotel run by her good friend Diana. After a series of minor thefts, Lupin feels she has to use her odd deductive powers to restore order. But in spite of her best efforts, theft follows theft, then a guest's car goes out of control after the steering nut is intentionally loosened. Diana gets injured in the crash, and Lupin takes over the running of the hotel, and has to cope with the eccentric (and mainly unconvincing) guests, with predictable results. Then someone sets fire to the hotel - and the police, inspired by one of Lupin's comments, eventually track down the major culprit. The plot grows increasingly tedious, and even Lupin's funny mistakes aren't so funny any more, as when she interviews a new servant for the hotel, only to discover that the woman has come as a guest, or when she mistakes a gasman for a detective. It all gets too obvious as well as being repititious, although she can still be amusing at times, as when she writes to her husband that "there are daffodils in the grass and blossom on the trees and all that sort of thing. I'm afraid I'm not much of a hand at describing things, but it really is rather nice. A bird is singing too. I shouldn't be surprised if it were a blackbird or a thrush or something." As one of he guests tells her, "Yours is a very sympathetic character .... not deep, the mind underdeveloped, floating on the shadows of life, yet good-hearted and ready to help others according to your limitations." That is why, according to Lupin, "No one can look at me without telling me the whole history of their past life". At first she wrongly identifies the criminal as being a particular woman as "it must be a lunatic, and she is the only lunatic here". But most of her (real) comic possibilities were exhausted in the first book, and now we are reduced to such feeble confusions as interpreting a potential guest's wish to get a booking confirmed with a wish to get confirmed in church. It is no more than intermittently amusing. It was the Rue Morgue Press who changed the title to Penelope Passes with their 2003 reprint as "the editors decided that it was the title Joan Coggin would have used for this book had she given it more thought". Penelope Passes is set just after the Second World War. It tells how 39-year-old Penelope Stevenson is (eventually) found shot to death in her garden. Lady Lupin Hastings is over thirty now, has been married for ten years and has two children. She seems to be getting quite used to solving murders. "There must be something queer about me," she says, "like those people in Greek tragedies. The minute I arrive upon the scene everyone cries, 'Let's have a murder.' " But Penelope is an unlikely murder victim, as practically everyone (including herself) thought she was quite the most noble person they had ever met, a woman who had sacrificed her own happiness to look after her widowed father and younger brother. So could it be suicide? She did not seem to be the suicidal type, and anyway the revolver beside her had been wiped clean of fingerprints. Then two of Penelope's family independently confess to the murder. But it's Lupin who eventually has a brainwave ("I don't often get one so must make the most of it") and realises what must have happened. Lupin herself remains quite an entertaining character who still always says whatever comes into her head, but the book is full of lengthy conjectures as to what might have happened, and long, boring and repetitive conversations. Indeed even the private detective hired by Lupin joins in happy chats with not only the investigating police inspector but even the Chief Constable! There is absolutely no exciting action - indeed not much action of any kind. According to the editors, the book "appears to have been written and published in a great hurry, since the original book is filled with typos and two of the characters are given more than one name". Indeed on page 78, the same character is referred to by the author as both Colonel Graeme and Charles. Admittedly, Charles is his first name, but this still causes confusion. Indeed it is found necessary in this, as in all the books, to start with a list of all the characters, with explanatory comments attached, such as "Lady Lupin Hastings. Not your average clerguyman's wife, she's as kindhearted as she is scatterbrained. But not much escapes her." Or "Col. Charles Graeme. Penelope turned down her chance for great happiness with him, but he has never stopped loving her." I found I had to frequently turn back to this list to remind me who was who, but, to have to include it was really an admission of failure. The pages and pages of speculation make this quite a hard book to read, and badly needs an editor's pruning. It's a pity that the Rue Morgue Press did not do more than change the title, tidy up the text and Americanize the spelling. Dancing with Death is set in 1947 and tells how Lady Lupin's old pals, Tommy and Duds Lethbridge, having inherited a modest manor house in Buckinghamshire, decide to give an old-fashioned week-long Christmas house party to help take their minds off post-war English austerity. This feeling of austerity is well expressed by the problems they face of little food and even less strong drink. The hosts hope their guests will bring their ration books, for even sweets and tea are rationed. They feel they are doing well to be able to offer even "soup, rabbit stew and semolina pudding". Unfortunately the party does not go at all well, what with the guests, including two pretty young twin sisters, constantly bickering, the gin running out, and Duds desperately wanting to see the last of her guests. But then one of the sisters dies, poisoned. Did she deliberately commit suicide - and, if so, why? Duds knows it is time to send for Lady Lupin, who is not convinced by the coroner's suicide verdict. and sets about finding out what really happened. This book has a stronger plot than the others and begins well with a teaser in which Lady Lupin receives a telegram from Duds: "Am in great trouble, please come at once". There is then a long but entertaining flashback to reveal exactly what that trouble is. This works very well. Lady Lupin now has two children, Jill, aged 5, and Peter, aged 8 "who was home for the holidays after his first term at school". But, as she has a maid (who now does "nearly all the work of the house and a great deal of the work of the parish") and a nanny, she can safely leave the children behind. "It is a good thing mine are obedient children," she says. "Obedient to Nanny, I mean," she added, on second thought. It makes an interesting picture of life at the time, as does the subsequent use of heroin as an accepted treatment for asthma. It is she who decides to give her guests little Christmas stockings instead of presents, just like those they would remember having had as children. But, of course, she gets things muddled. It is Sandy, a sulky ex-prisoner of war, who "opened his stocking gloomily, displaying neither surprise nor amusement. The little bottle of smelling salts that Duds had put in for Mrs Dumbleton in place of the cigarettes did not serve to raise his spirits." The guest are well-drawn, including the ever-talkative Mrs Dumbleton who constantly tells people things they do not want to know: ""The trouble was," she said, "that a lot of people did not know that by voting Socialist they were voting against Churchill. I tried to explain to my cook but of course she thought she knew best and it was no good arguing with her or she might have given notice". And her husband, Henry, "was enough to wreck any party with his air of knowing more about everything than anyone else". When Duds is stacking cups and saucers, Henry takes them from her "explaining as he did so that she should put the heavy things in the centrer of the tray and arrange the lighter ones around them. He said there was really nothing in housekeeping if one went the right way about it. He was surprised that she had not an electric machine for washing up. It would have made all the difference .... In America, they had all the latest gadgets. He had known one woman with a husband and four children and no servant who ran her own home perfectly, and yet found time to be president of one of the leading women's clubs, and to give lectures, twice a week. She was also an expert bridge player and gave a great deal of time to the studying of economic problems." It is almost half-way through the book before Lupin actually arrives, but, oddly enough, her investigations seem to slow the action down rather than add some excitement. "At the sight of her, strong silent men and quiet reserved women were seized with a desire to unburden themselves." But these unburdenings get too prolonged, even tiresome. Other characters, such as the pretentious novelist Olivia Ordemar, are more entertaining: "I am afraid when I am immersed in my work I am shockingly unsociable," she explains. "I lose touch with the tangible world and get lost in a world of my own creation." "It must be very interesting," hazarded Borden, the private detective, once again employed by Lady Lupin to help her investigations. "Interesting," said Olivia intensely, "Yes, sometimes it is interesting but sometimes it is heartbreaking. I have to follow as I am led and sometimes the way is hard and thorny." "Yes," agreed Burden, sypathetically:"A writer who really gets inside her characters as you do must often suffer with them." She looked at him with respect. " How well you understand," she said. "Some people think that you can write with your brain and with your hand, They do not realize that it takes your whole soul." The author is much stronger at this sort of gentle humor than with dramatic action sequences that she tends to avoid. So when, in a not very dramatic finale, another character commits suicide, she does not describe it as it happens, but just has people talking about it: "She bent down," Duds says, "but of course it never struck me what she was doing. I thought she was fastening her suspender." It turned out that she had given herself an injection of diamorphine (heroin). There is little about the author on the web. The best source of information is the introduction to the Rue Morgue reissues, from which I have drawn most of the biographical information. This is also to be found on the Rue Morgue Press site. The cover on this modern American reprint reproduces the original jacket art.